Checklists are about embracing a culture of quality and discipline. As an advisor, you deal with complexity on a day-to-day basis. You’re managing investments, financial plans, client emotions, team dynamics, administrative paperwork, compliance and more. You can’t remember everything. It’s just not possible. When it comes to key business processes, you either have a process by design or by default. For most advisors, it’s by default (i.e., it’s just the way we’ve always done it). What would happen if you sat down and really thought through the most critical processes in your business? Do you think these processes would improve? We do. What if the answer was as simple as a checklist? In his book, The Checklist Manifesto, surgeon and author Atul Gawande explores how surgeons, architects, pilots and VCs use checklists to dramatically reduce errors and increase discipline. Gawande makes the case for breaking down complex processes into tiny checkboxes. The concept isn’t revolutionary. In fact, most of us create a checklist every morning: the to-do list. Gawande offers valuable insight not only into why checklists are important, but how to craft them in a practical and user-friendly manner. When thinking about the types of checklists you’d like to create, consider your current processes around the following areas. Define a clear point at which a particular checklist should be used. Gawande refers to this as a “pause point.” There should be a triggering event at which the checklist should be initiated. For example, if you are building a checklist for client onboarding, your “pause point” might be when the client signs the account paperwork. Focus on the most essential steps—not every possible step imaginable. Checklists are not instructions. You’re not building a checklist to train someone how to do a particular task—to spell out every possible step of the process. Instead, you’re building a checklist to ensure you complete all aspects of a process. When checklists are too long or impractical, they just don’t get used. If you want the checklist to be used, don’t overlook formatting. Gawande also stresses the importance of formatting your checklist for ease of use. Checklists should use exact, easy-to-read language. They should use large type and ideally should fit on one page. 1. You don’t need a checklist, for your checklist. Don’t get checklist-happy. Many advisors fall in love with this concept, and that’s good to an extent. However, you don’t need a checklist for every single aspect of your business. Think about the core processes within your business that have the most moving parts and are most vital to your success. 2. If your team doesn’t believe the checklist is useful, it’s worthless. As the team leader, start by defining the five to 10 processes in which you feel a checklist would be most useful. Next, meet with the team to begin building and editing the checklists. It’s imperative for the team to have input and make edits. After all, they are the individuals implementing the checklist you are discussing. Once you create the initial checklist, look for steps you can remove. Remember, less is more. 3. Create an endpoint for each checklist. Once a checklist is complete, where does it go? The trash? It shouldn’t. To ensure checklists are being used appropriately, they should be submitted to a team member after completion. Below is a partial example (sorry, we can’t give everything away) of our Client Review Checklist. 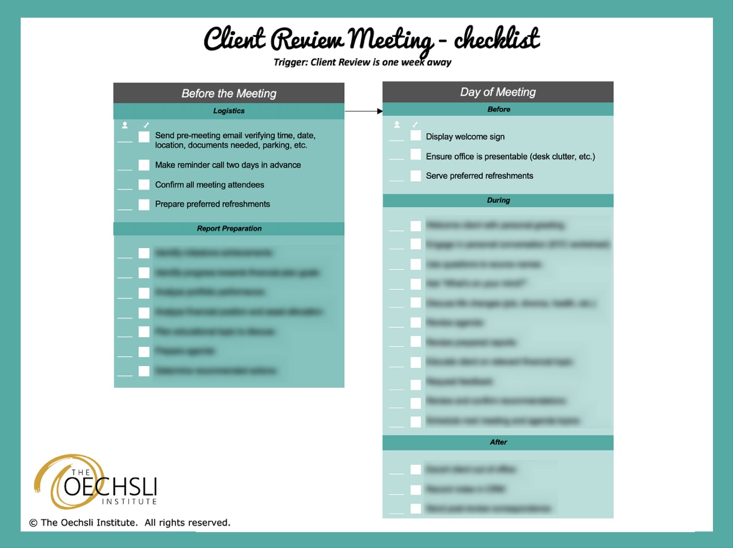 If you want the full version of this checklist, plus many more, you’ll need to join us for our segment entitled Essential Checklists during our upcoming retreat in Charlotte, N.C.
Checklists are about embracing a culture of quality and discipline. They force everyone to a higher standard. What’s our final, and arguably most important, tip when it comes to checklists? It starts with you, the team leader. You can’t expect your team to embrace this new culture, if you don’t lead by example. @StephenBoswell is President of The Oechsli Institute and co-author of Best Practices of Elite Advisors. @KevinANichols is the Chief Operating Officer for The Oechsli Institute and co-author of The Indispensable LinkedIn Sales Guide for Financial Advisors.